Dr. Tu joined Guangzhou Institutes of Biomedicine and Health, Chinese Academy of Sciences (GIBH) as a Principal Investigator in 2010. Previously he was a research scientist and senior research scientist in DMX Inc,. and Reaction Biology Corp. USA. During 1998 and 2000, He did research as a visiting scholar in Vanderbilt University. He did the post-doctoral research in Fudan University from 1996 to 1998 after obtaining his Ph.D. in Agriculture University of Northwest and Kunming Institute of Zoology. CAS. Dr. Tu mainly researches on Microorganism, Immunity and treatment for the inflammation using natural small molecular and monoclone antibody. Recently he focuses on the High Throughput Screening and mode for drugs and developing the novel drug for leukemia, breast cancer, diabetes, flu, Hepatitis C and EV71. Screening the potency of a compound is a common starting point for new drug discovery. High-throughput screening (HTS) allows the testing of many compounds in a short time and is an important area of drug discover research. Unfortunately, China started investing in HTS technology very late. It was only in 1996, that the Chinese Academy of Medical Sciences brought in the first Biotek 2000 automation workstation. Several years later the Shanghai Institute of Material Medical, Chinese Academy of Sciences and Beijing Academy of Military Medical Sciences, respectively established specialized agencies for drug screening and began to engage in large scale drug screening. At this time GIBH is seting up a HTS center of excellence for the screening of compound libraries to support the drug discovery efforts at GIBH as well as offer our services to Universities and Institutes. HTS at GIBH is focused on several areas: 1. Anti-viral drug development, 2. Anti-influenza virus drug screening a major spotlight in Guangdong Province, 3. Development of anti-tumor drugs supported by the National Natural Science Foundation, 4. Anti-diabetic drug development and 5. Development of anti-HCV drugs and several other. Up to now, we have successfully established a series of biochemistry and cell based screening assays using 384 micro plates, employing the most sensitive detection technologies such as time-resolved fluorescence，fluorescence resonance energy transfer, fluorescence polarization and other related methods. Before establishing a screening lab at GIBH, labs routinely sent their compounds to European or American companies, with each reaction typically costing $10 to 20 dollars. However, each reaction in our institute now just costs ¥10 RMB ($1.5 USD) and so far, we have completed >4000 reactions for various projects, saving the Institute more than $75,000 dollars. 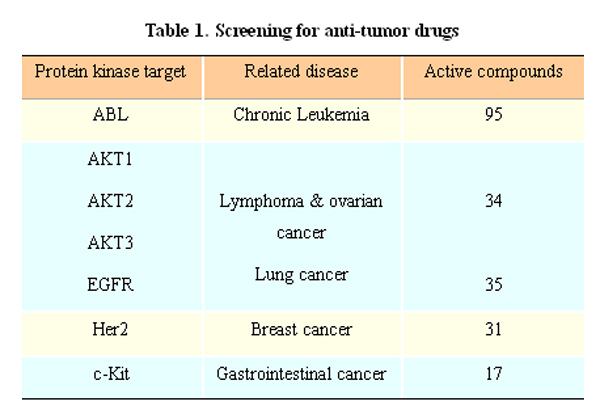 Several drug screening assays for testing tumor-associated protein kinase inhibitor, have been established. Based on these screening assays we have identified 212 novel anti-neoplastic compounds provided by Dr. Ke Ding and Dr. Jiancun Zhang. Detailed information for those target screening results is listed in table 1. Using both (neuraminidase, NA) biochemical and cell based screening assays we have identified 60 compounds that block the replication of the influenza virus, three of which, named ZX-3-138, ZX-3-134, ZX-3-142 show much higher anti-viral activity than Amantadine. EV71 virus mainly causes HFMD, throat, and cheek inflammation. At this time there are no effective drugs to cure these diseases. 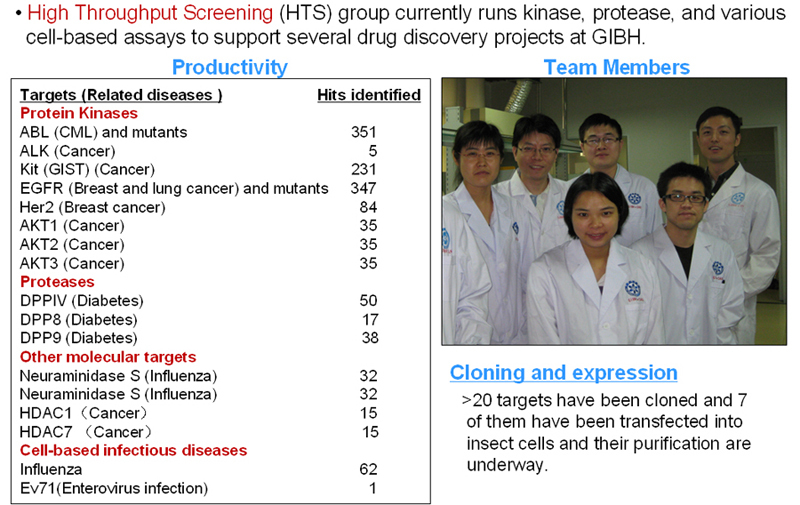 At GIBH, We have established an infection model using African green monkey kidney cells for screening compounds. Using this assay we have identified 13 anti-viral compounds with some extended activity against the EV71 virus. Using a DPPIV assay, we have screened and identified 55 highly active compounds against DDPIV enzyme provided by Dr. Wenhui Hu with IC50 values of＜10-9 M.
We have established several anti-HCV NS3/4A inhibitor screening assays to test targeted drugs. The protein kinase family of enzymes represent potential key drug targets. It is our intention to build a comprehensive protein kinase library containing several hundreds kinases. As a cost saving measure, we are expressing many of the kinases internally. At this time we have cloned 26 important protein kinase genes to date, 16 of which have been transfected into insect cells (sf21). Their expression and purification is ongoing. Currently, 5,000 compounds have been made at GIBH targeting various proteins/diseases including cancer, Alzheimer’s, type II diabetes, arthritis, malaria and anti-viral. These compounds have wide structural diversity and biological activity. All compounds are currently being deposited into a central library for easy access and over the next 5 years the library is anticipated to consist of over 30, 000 molecules. To establish an automated high-throughput screening center, we have purchased a liquid automatic liquid handler system and PE Envision multi-plate readers with related automated equipment. At this time we are able to conduct more than ten thousand drug screening reactions per day. In the mean time, we are acquiring a library of natural molecules and soon will have an internal library of natural molecules for drug screening. The High Throughput Screening Center will be open to various medical research units and pharmaceutical companies in Guangdong, which will promote the development of new drugs and research in Southern China.